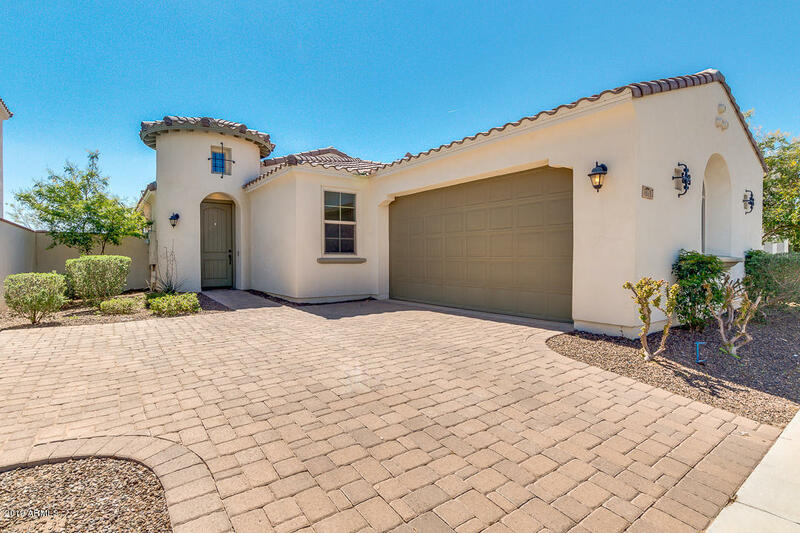 Come see this stunning 3 bed, 2 bath single-story home for sale in the East Valley's vibrant planned community of Eastmark! Featuring desert landscaping, 2 car garage, open-concept dining and living areas, a cozy den, and neutral paint throughout, you simply won't believe the bang for your buck! In the fabulous kitchen, a bounty of roomy closets and cabinetry, quartz countertops, stainless steel appliances, and a lovely island with a breakfast bar await your discerning eye. Inside the posh master bedroom you will find a luxury en suite with his and her sinks, as well as a spacious walk-in closet that features an ''alternate exit'' door for your family's safety. The expansive backyard has been updated with artificial grass landscaping, a small garden with pergola for your organic preferences, a covered patio and a paved seating area which includes an outdoor fireplace for gatherings of family and friends! And did we mention the magnificent sliding glass wall that extends the outdoors into your home? And that this home is energy efficient, complete with solar panels? ! Or that it won't be on the market very long? Schedule a showing today!